On September 11, 2001, a series of four coordinated terrorist attacks were carried out by the Islamic terrorist group Al-Queda, with New York City feeling the brunt of this horrific tragedy. The events of 9/11 represent the largest attack and subsequent rescue and recovery operation ever on U.S. soil. In just a few short hours, both of the monstrous, 110 story-tall World Trade Center Towers, were devastated by two separate hijacked commercial airliners that were flown into them. The entire world watched in awe as nearly 3,000 people lost their lives as the buildings crumbled. Downtown residents Elizabeth (Liz) Williams and Catherine Hughes (then Chair of Community Board 1, which covers the area of the World Trade Center) were among the thousands who witnessed the attack. They watched in wonder as they observed emergency responders work feverishly to save the lives of others, even at their own peril. Subsequent to the attack, Liz and Catherine realized that they needed to memorialize the great sacrifices so many first responders made on that fateful day. They sought the assistance of then Assistant Chief Thomas Purtell, Commanding Officer of Patrol Borough Manhattan South. On 9/11, Chief Purtell was assigned as the Commanding Officer of the NYPD’s Special Operations Division and he commanded the Department’s rescue and recovery operations at the World Trade Center site, which had become known as “Ground Zero”. 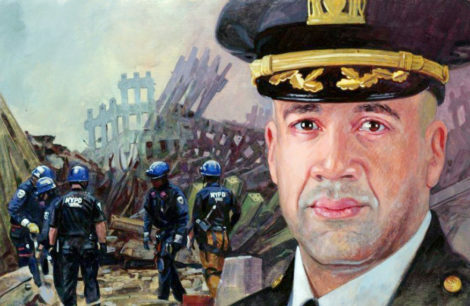 Liz and Catherine’s vision was to create a series of paintings that would highlight and visually tell the story of bravery, heroism, and sacrifice that was exhibited by NYPD personnel and other rescue workers on that tragic day. They partnered with the Society of Illustrators, a group with a longstanding history of supporting the military and law enforcement. Liz and Catherine worked with the Society of Illustrators executive vice-president Victor Juhasz, Who coordinated the creation of eighteen pieces of artwork in collaboration with the Police Department. The art pieces depict NYPD members performing heroically in the line of duty during the terrorist attacks and their aftermath. Each one was created from a scene photographed following September 11, 2001. In September of 2015, during another exhibit of the collection at Police Headquarters, the surviving members od the service portrayed in these paintings, as well as their families, were invited for an additional viewing. In December of 2015, a collection of the artwork was displayed in the U.S. Senate Russell Building Rotunda, where legislators could view the depictions while they contemplated legislation that would greatly impact the health and wellbeing of 9/11 first responders. Soon thereafter, Congress reauthorized the James Zadroga 9/11 Health and Compensation Act. The paintings were also transported to the 9/11 Memorial Wall and displayed during the 15th Anniversary Ceremony for all to see in 2016. This recent exhibit, showcasing the full complement of the original artwork, is being held by the New York City Police Department in partnership with John Jay College of Criminal Justice. John Jay College is an international leader in educating for justice. In teaching, scholarship, and research, the College approaches justice as an applied art and science in service to society and as an ongoing conversation about fundamental human desires for fairness, equality and rule of law. Sixty-seven members of the John Jay College community lost their lives on September 11, many of who were members of the NYPD and FDNY.